1) Food prices are increasing due to drought, extreme weather and disease, food prices. Grow your own and you will pay less in the long run. 2) Fresher foods have more nutrients. Studies show that "local food has a shorter time between harvest and your table, and it is less likely that the nutrient value has decreased." Picked a moment ago, eaten now? That is as a short of a time as I can think of and can happen when you grow your own. 3) Global population continues to increase, straining agriculture. A recent UN report argues that the only way to feed the world is through small scale organic farming. Might as well start in your backyard or on your balcony! 4) If you are concerned about pesticide residue or GMOs, you can readily solve that challenge by popping a few seeds in a pot. Growing your own also reduces contamination issues because "the more steps there are between you and your food's source, the more chances there are for contamination." Peach recall anyone? Not here because we eat our own peaches (or this last week, my mom's). 5) Anyone who has comparison tasted a home grown tomato and a supermarket one can tell you, fresh rules! 6) Regenerative agriculture "enables the restorative capacity of the earth". That's a fancy way of saying that small scale gardening which relies on compost, mulch, water collection, and a diversity of plants is good for the planet. For most home gardeners, those things are comfortably in our wheelhouse. 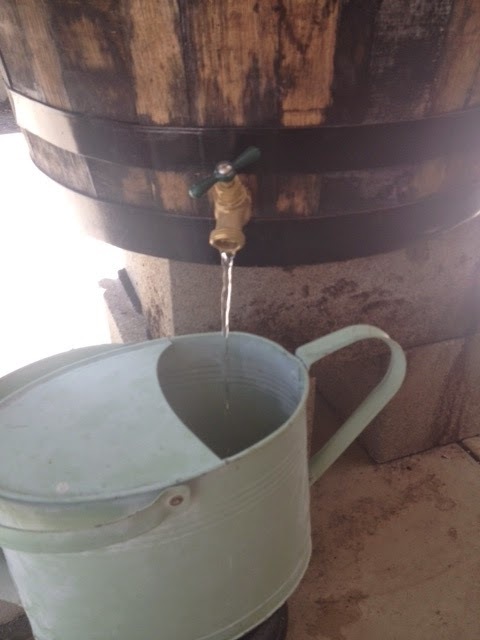 We are not just gardening any more. We're regenerating here, people! 7) "Habitat loss ... is the primary threat to the survival of wildlife in the United States." 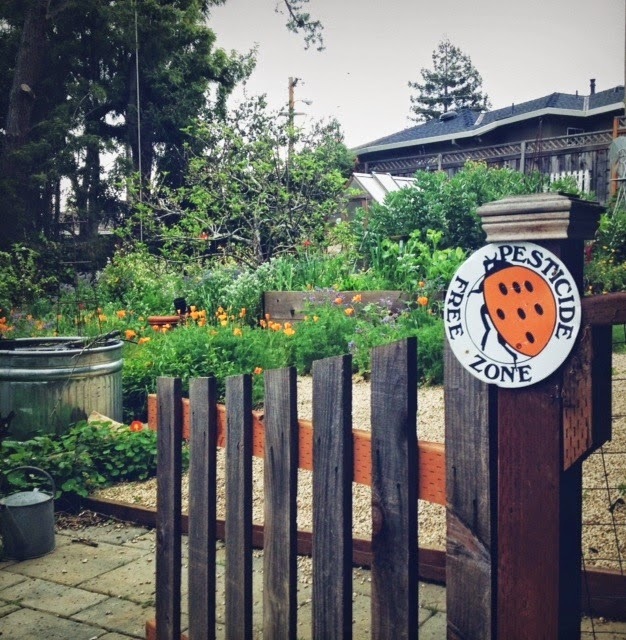 Planting a garden may not help the wolves, jaguars and bears out there but it will help give beneficial insects, like pollinators, birds and lizards a toe-hold. Even if you primarily garden for food, it is a good idea to grow a few flowers amongst your food crops to attract pollinators and deter pests. Even those few flowers provide a wee bit of habitat for the creatures with whom we share our planet. 8) Yesterday, I spent an hour straight in my garden - raking up straw and leaves and then spreading it as mulch around my various plants. I was shocked when something wet hit my risk. Sweat. It turns out that gardening is actually decent exercise! Of course, it depends on what you are doing in the garden but I'll take it. 9) A garden can beautify any place - balcony, front or back yard or even a kitchen counter. If you doubt me, check out these instagramming balcony gardeners: NatsBalconyGarden and ThePinkHippie. 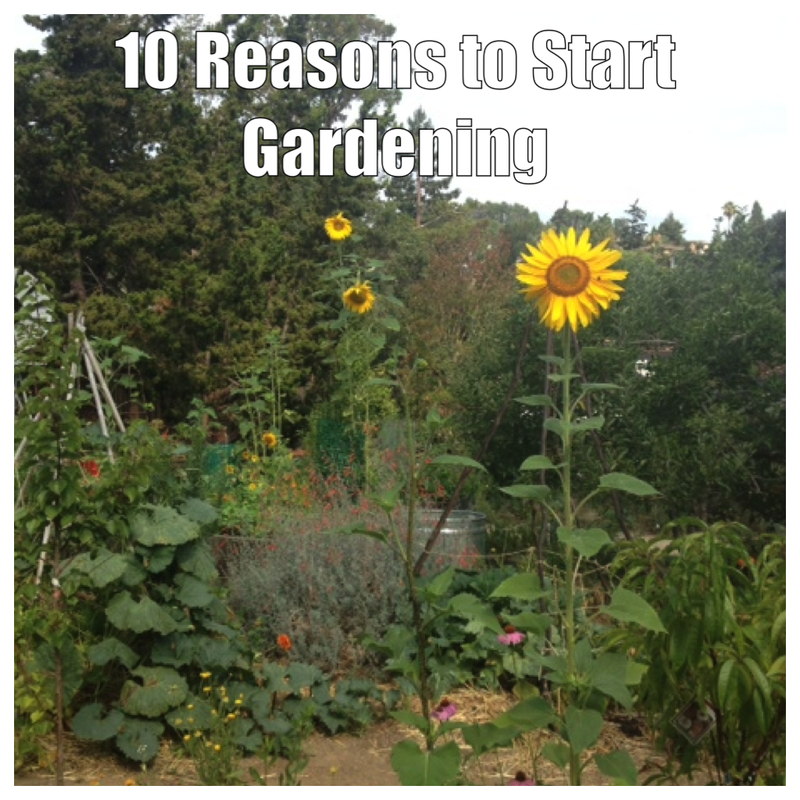 10) You know the saying, "Gardening is cheaper than therapy, and you get tomatoes!" It is true. Studies repeatedly document the healing and de-stressing properties of being outdoors. Getting outside does not have to require an hour long hike out in the boonies. Stepping out to that pot of peppers on the front porch or checking in with the herbs growing in the balcony planter all count. I speak from experience. It is cheaper than therapy and this time of year, boy oh boy do I get tomatoes! Enough reading. Get out there and grow something! Amen Sista! I could. It agree with you more. Great post. I love this post. That bee photo is amazing. I love this post and can’t imagine not growing my own food! It just feels so right to work on something that rewards you with nutritious and delicious food. 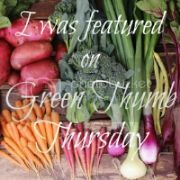 Thank you for sharing at Green Thumb Thursday! I hope we will see you again. @Christy: Thank you, from one garden addict to another! @Betsy: I am quite proud of that photo but it was mostly just frantically clicking and then, oohhhh, look what photo I got! @Rachel - Thank you for hosting! Love your list. I am also in love with the smell of a tomato plant and fresh carrots. Can't find those smells in a store!